During the 1980s Hodgkin continued to experiment with scale. Snapshot 1984–93 was one of his largest works and its title underplays the nine years that it took him to complete. Meanwhile,Fisherman’s Cove 1993, one of Hodgkin’s smallest paintings, possesses a fluidity and boldness of brushstroke that appears disproportionate to its size. These works demonstrate Hodgkin’s ability to make large works seem intimate and small works epic. 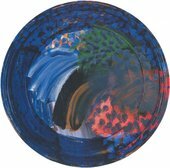 Various found domestic items – stools, table-tops and old clocks – have provided unlikely supports for Hodgkin’s pictures, emphasising his view of them as objects. For example, the knife marks visible in Evening 1994–5 draw attention to the wood panel’s former use as a bread board.